Oakland is the latest city to consider an LA-style bicyclist anti-harassment ordinance. 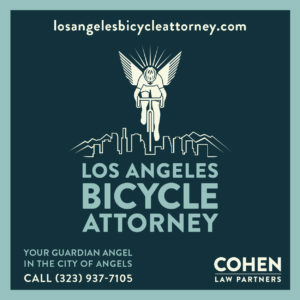 However, there’s a hidden problem with these kind of ordinances, as LA bike lawyer Josh Cohen recently pointed out. LA’s law, and most, if not all, of the similar ordinances that have followed throughout California, allow the court to award lawyer’s fees if you win your case, as an inducement for attorneys to take cases that might not otherwise be worth their time. The problem is, lawyers usually collect their fees from insurance companies when they win a case. But insurers don’t pay for intentional acts. And the whole point of the anti-harassment ordinance is to punish drivers for their intentional actions in harassing riders. Which, by definition, lets the driver’s insurance company off the hook for any damages, including attorney’s fees. So unless the driver who harasses you has a major bank account or significant assets that can be converted into cash, it may be difficult to find an attorney to take your case. Which is no knock on lawyers; while some may take a case pro bono when they can, they still need to pay the bills like anyone else. And that means lower income drivers could have carte blanche to threaten you on your bike with little fear of any consequences. The short term solution is to act as your own attorney in small claims court; Cohen says he’s working on an online tool kit that that will teach riders how to build a case and guide them through the legal process. A longer term solution is to pass a statewide version of the anti-harassment ordinance, so enforcement no longer depends on invisible city limit lines. An offense that occurs in Santa Monica or San Gabriel is just as offensive as one that takes place in Los Angeles, and the offender should face the same consequences. And while we’re at it, let’s change the law to require insurance companies to pay for all adverse traffic acts, intentional or not. Maybe when they face the costs for the threatening actions of the drivers they insure, they’ll actually do something about it. And maybe get some of these jerks off the road once and for all. Streetsblog’s Damien Newton takes an in-depth look at the proposal to increase the sales tax to fix LA’s streets and some, but not all, sidewalks. While virtually everyone benefits from better streets — bike riders not the least — there needs to be a firm commitment to build out the bike plan as streets are repaved and striped, rather than the vague promises we’ve been offered so far. And since everyone walks, there should be at least as much commitment to fix every broken sidewalk as there is to repave failed streets. The question is whether Angelenos will swallow yet another sales tax increase that places the burden of street repair on everyone, whether or not they use them. Or whether they contribute to the disrepair of our streets by rolling massively oversized multi-ton and highly destructive vehicles over them. LA City Councilmember Mike Bonin hosts a free Fireside Chat on Transportation: The 405, Traffic, Transit, Biking & More on Friday, April 11th. That’s one I’d like to attend. Frequent contributor Erik Griswold looks at the city that bans play; yes, that would be our very own LA. Flying Pigeon says the bike infrastructure infection is spreading. Meanwhile, those new green bike lanes in Santa Monica may be nice, but they’re not what cyclists were promised, and there’s still more work to do. Not the least of which is figuring out what to do with the city’s airport, which may be best done by bike. 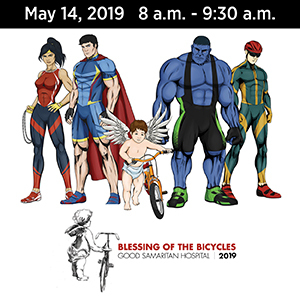 Now this sounds like fun, as a planned May ride will visit the murals of Northeast Los Angeles. LA students call for fixing San Fernando Road, including bike lanes and better sidewalks. How Sweet Ride USA’s Steve Isaacs went from musician to creating a unique mash-up of bikes and deserts. 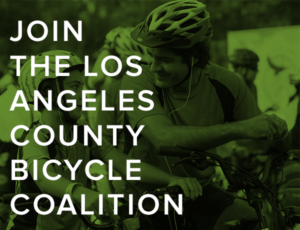 Mark your calendar for California Bike Advocacy Day on May 21st. A Riverside hit-and-run driver gets nine months for leaving a seriously injured bike rider to bleed in the street. More than a slap on the wrist, but hardly what the crime deserves. This is why you always carry ID when you ride. Oakland police were trying to identify a man who was critically injured in a solo fall when he went over the handlebars; fortunately, the 80-year old rider was eventually identified. Your loved ones deserve to know where you are and what happened if you’re too injured to speak for yourself, and you deserve to have them by your side. Can protected bike lanes push bicycling into the mainstream? If they can’t, maybe the rise of the combination bike shop/bar can. A new team-based East Coast track cycling league is set to roll out next year. My hometown is nominated as one of the nation’s top 10 bicycling cities; needless to say, Los Angeles isn’t, and neither are leading local candidates Long Beach and Santa Monica. Wait, what the hell is Malibu doing on the list? Fargo cyclists may be afraid to use a new bike lane because motorists certainly aren’t. Eighty-two-year old Omaha driver opts to kill the person on two wheels rather than collide with the vehicle stopped ahead of her. Nothing stops Minneapolis bicyclists from riding, even in the dead of winter. Same with most LA riders, as long as it’s at least 70 degrees out. More proof that hit-and-run isn’t just an LA problem, as a Pennsylvania Amish buggy driver hit an SUV twice before trotting sedately from the scene. He still doesn’t get it. The Aussie cab passenger who doored a cyclist refuses responsibility, but does admit to acting like a jerk afterwards. And Melbourne’s top bike cop says the city’s patchwork bike lanes give riders a false sense of security. Finally, chances are, you’ve already seen this one by now. 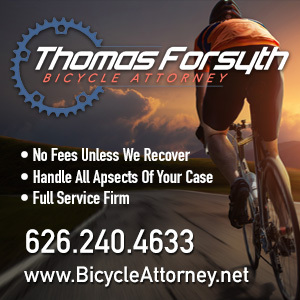 But if not, you definitely need to, as a cyclist is hit by a mattress carried by a passing truck — which miraculously flips under him and cushions his fall, saving him from serious injury. Thanks to Michael Eisenberg for the heads-up. And it’s been over a century. So where’s my flying bicycle, already? If he has a car, I’ll settle for title on the car. I am new to bike commuters, live in Los Angeles. my first month ride to my work has been more than wonderful. great feeling to be the part of natural / healthy environment while gaining exercising minutes….. until today. My commute (bike) is only about 20 minutes, I usually stay at the very right lane but had to shift to a left lane because I needed to turn left soon to arrive at my office. I was following a role, try not to disturb car drivers as much as possible. Then, suddenly heard ” get a way~, asx hxle’. I soon determined, i annoyed the driver without intention, so I actually passed the building, changed the lane to the right close to shoulder, found the crosswalk so that I can “walk” to cross to the other side of the street. “you are now blocking the work area”…. unfortunately, the driver works for LA DWP, the truck was owned by the same. My entire day was ruined because of this. Honestly, I am now afraid to bike tomorrow on. If there is any other bike commuters experiencing like my example today, I would like to know. I took a photo of the number plate, I would like to report or voice out to someone to protect others in future. Anyone at there who has the same experience(s), or know where to report “effectively” so that the driver will learn something more than yesterday, please let me know. I wish I had good advice on how to report it effectively. I had a similar experience with a driver from the city Bureau of Street Services. He kept laying on his horn and screaming at me to get on the sidewalk, then repeatedly threatened to hit me with his truck. The only thing that got it to stop was pulling out my phone, loudly telling him that I was recording video, and asking him if he was willing to threaten me on video. That was the day I bought a GoPro and now ride with it helmet-mounted. I thankfully haven’t had any real need for it since I bought it, but I figure that if the day comes when I do it, the video from it will help in making that effective complaint. I hope that publishing video of an incident if I get an unsatisfactory response will have the same effect as that video recently of a Metro bus driver cutting off a cyclist – enough public uproar that eventually the organization has to at least respond in some fashion. FWIW, I don’t really know if my complaint to BSS was effective or not as they have never responded in any fashion. Honestly, I was intimidated when he blocked me with a big truck, having Gopro already mounted on my helmet might calm the driver down..
Later I briefly did web-surf about the same topic.. I was amazed how many people had similar experiences like me, or even worse. but I couldn’t find an organization who submit reports / voice out for public.